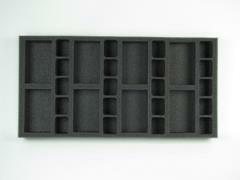 This tray can hold eight artillery bases for Flames of War. It also has room for twenty support models. 1.5 inch (38 mm) thick tray with 8x 3 1/4 x 2 inch (82 x 51 mm) cut outs and 20x 1 x 1 1/4 inch (25 x 31 mm) cut outs.